We hosted our first Thanksgiving feast this year! It was a small intimate gathering, but I still wanted to do a couple of quick and easy table decorating projects to go that extra mile. And they were all things that could be relevant year round so I thought I would share a couple of them with you throughout the week. The first one was inspired by Mr. Pinecone. We have all seen pinecones. 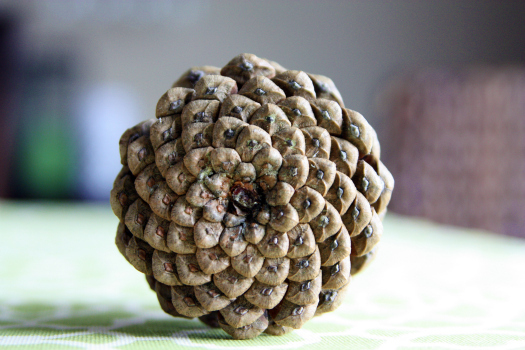 But have you ever really examined a pinecone? The bottom of a pinecone specifically. It looks almost like a flower to me, and I adore it! 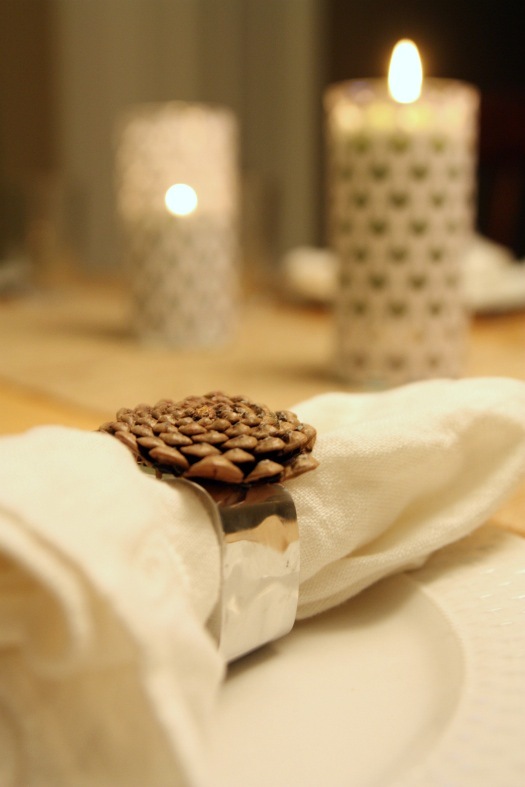 I thought the flower part of the pinecone would look pretty fantastic hot glued to my standard napkin ring, just to give it a little more character. We tried all sorts of ways to cut off the bottom of the pinecone; scissors, serrated knife and wire snips, but ultimately had to resort to a miter box and saw. That was the hardest part. 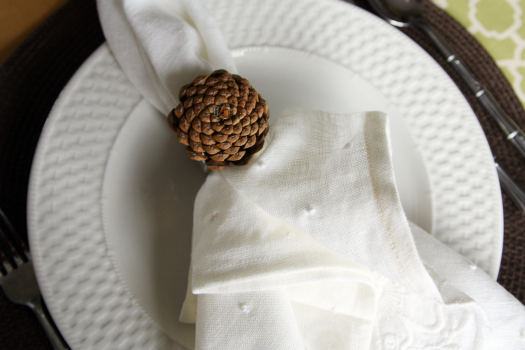 The last step was to dab some hot glue on the bottom of the pinecone flower and attach it to a napkin ring! 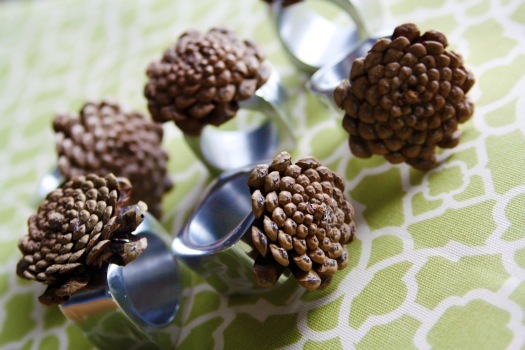 Because I already had the napkin ring holders and found the pinecones at the dollar store, the cost of the project was one whole dolla for six updated napkin ring holders! Pretty festive eh? 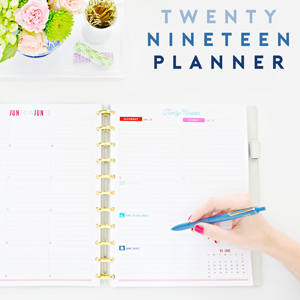 I am super crazy excited about quick, easy and cheap projects that add a splash to the table! And the best part is that it doesn't have to be permanent since hot glue is notorious for coming off of glass and smooth finishes nice and easy when you don't want to use it anymore. Anyone else host a big feast this year? How did it all go down? Was there a table setting piece that was the topic of conversation or that you tried out for the first time, and it was a show stopping success? Do share! 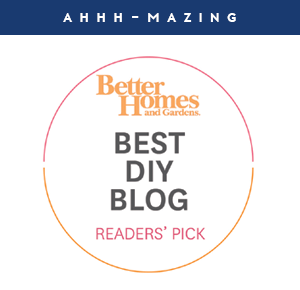 I just have to tell you I simply adore your blog. Oh my! 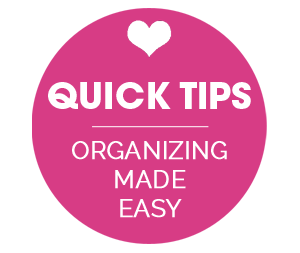 I love your style and of course your organization system.. Thank you for inspiring me! I didn't host a dinner or make any table setting pieces but my daughter and I did make a mobile out of pinecones (and wire butterflies) for her room. We collected some pinecones and painted them bright colors because I too think pinecones are beautiful and wanted to do SOMETHING with them. We then took the painted pine cones and some wire butterflies and glued them onto the (too)many "dress-up" necklaces that my daughter has collected over her 6 years. :D Then hung the neacklaces from a metal hoop, added some ribbon and DONE! So cute! Oh how pretty! I had never looked at a pine cone that way before! Love it! Those are so pretty! What a great idea -- super cute and more eco friendly. ...if you use actual pine cones. You could've come to my house and picked them up out of my front yard for FREE. Better yet, I would've PAID YOU to take them. 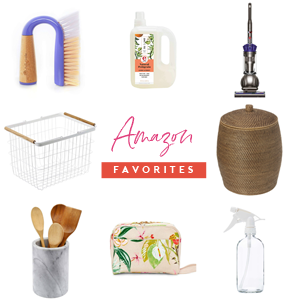 :) Great use for those things that litter up my yard though, thanks! What a lovely idea! 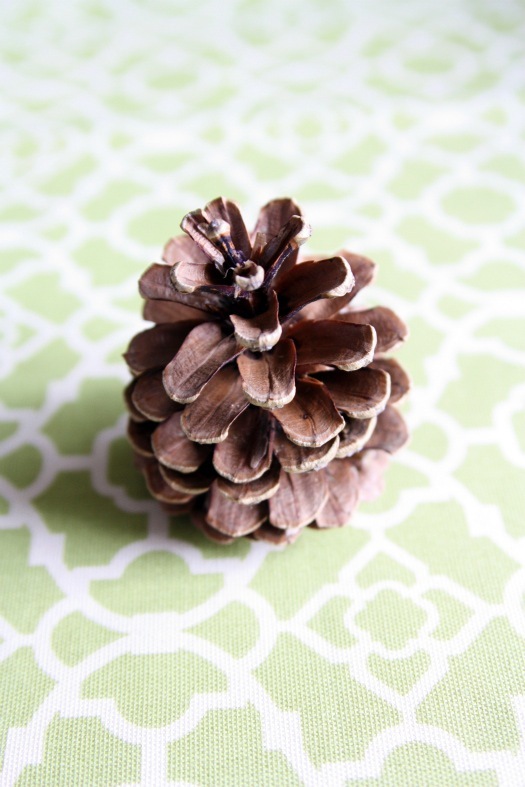 We use pinecones as part of the kids' nature toy collection, but I'm not crafty enough to turn them into anything else. I had never looked closely at the bottom of a pine corn before, but now I love it. What a smart idea, and it adds such a wonderful natural element to the table. Thanks for the inspiration! How charming! Those are real pinecones, yes? My mother, a very crafty soul if ever there was one, would gather heaps of them and use them for projects both at home and in the classes she taught. Love the idea!!! Thank you! This is so sweet and simple. I just love them! I made wine cork place holders (http://www.hardlyhousewives.com/2011/11/cork-place-card-holders.html) and I really want to try these napkin holders. I bet there will be lots of new crafts popping up with pine cones on them. :-) What a good eye you have. So cute! I love deconstructed pine cones. They almost look like rings you could wear on your finger! Great idea! I love how intricate these are. I had an aunt who came to my house once and started picking the pine cones off my trees. They were more tiny and rose like and she was going to use them as tiny rose buds for some centrepiece. So clever! I love them. We used to pick up pine cones all the time around Christmas when I was little but they don't seem to be around much anymore. 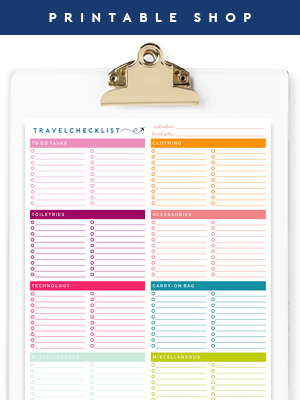 It's cute and simple. You can actually better appreciate its natural beauty without the paint. That is absolutely adorable! I love how pine cones can be so easily made into decorations. Especially when I've got about a million sitting in my front yard. The ideas are flowing in my brain, now! Wow Jen! That is an amazing idea! I love how they turned out. 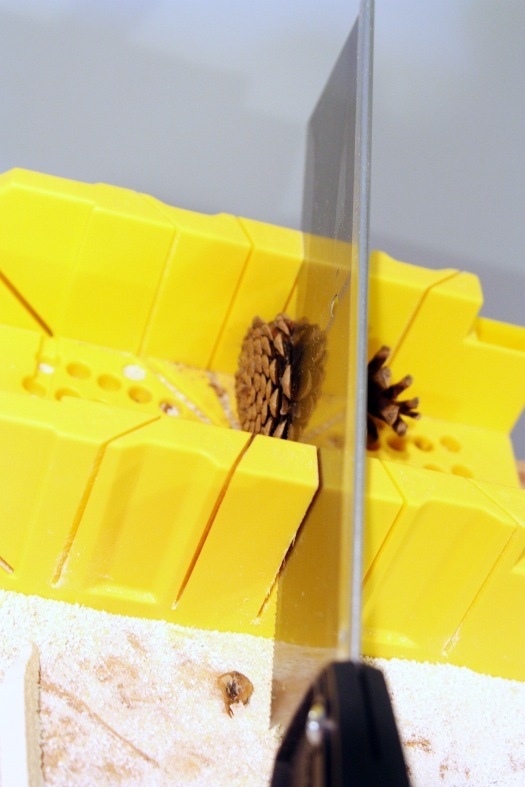 The vases you made are gorgeous and the pinecones are great. Back in the dark ages, when I was in Girl Scouts, we took the bottoms of those very small pinecones and turned then into cufflinks and earrings for our parents. I still think they look like brown mums. Great job! You did a wonderful napkin ring and you really did impress me! Such a clever girl! Two thumbs up! Cheer!